Elizabeth Butler-Sloss is a former senior judge with a reputation for a no-nonsense approach. She broke into the judicial elite when she was made President of the High Court Family Division in 1999, a post she held for six years before retiring last year. During a judicial career spanning 35 years, she was widely acknowledged for helping to open up the judicial system to women. Her decisions were often sensitive, and rulings over the custody of children after divorces made her a target for campaign groups such as Fathers for Justice. But colleagues say the mother-of-three was always fair in her rulings. Child law expert Allan Levy QC said: "She has an extraordinary understanding of people from all walks of life... she's also very patient. Even people who have lost their cases feel that she's given them a fair and sympathetic hearing." Richard Gordon QC said: "She's very practical, very down to earth, very robust, and very decisive." 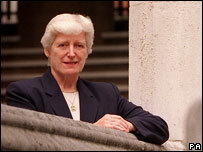 Lady Butler-Sloss, 73, was thrust into the public eye in the late 1980s during the Cleveland child abuse inquiry which resulted in the Children Act of 1989. The act incorporated many of her recommendations aimed at ensuring that children were not removed from parents unless absolutely necessary. She blocked a man's legal battle to see a test-tube baby daughter, who was conceived after his relationship with the mother broke up. In 1999 she said she supported the adoption of children by gay couples, although she did not go so far as to advocate a change in the law. Lady Butler-Sloss comes from a legal family. Her father was a high court judge, who sentenced to death Ruth Ellis, the last woman to be hanged in Britain. She is the sister to the late Lord Chancellor, Lord Havers, making her aunt to the actor Nigel Havers and his brother, Philip. Lady Butler-Sloss went to Wycombe Abbey School but never to university and was called to the Bar in 1955. She became a High Court judge in 1979 at the age of 46 and in 1988 became the first woman appointed to the Court of Appeal. In her early career she stood while pregnant as Conservative candidate in the Labour stronghold of Vauxhall and lost, then set up and ran a nursery for toddlers at a basement in the Temple, one of the Inns of Court.